The Fayoum was the favorite hunting ground for the Egyptian elite, especially the early Pharaohs. While hunting is no longer allowed, Egyptian myth has it that the first pharaoh, Menes, was attacked by his dogs while on a hunting trip to the Fayoum. He was saved by a crocodile and therefore dedicated a temple to Sobek, the crocodile god, declaring the lake a sanctuary. Since earliest times, crocodiles were worshipped in the area. During the old kingdom, mines in the area provided stone for monuments and the paving stones at Khufu's mortuary temple at Giza. Beginning during the rule of Senwosret II, but particularly during the 12th Dynasty's King Amenemhet I's rule, the area's importance was elevated because of his ingenious scheme to regulate the Nile floods using the Fayoum as a regulator reservoir. At that time there was a natural canal between the Nile and the Fayoum lake which at that time was called Me-Wer (or Greek Lake Moeris, meaning Great Lake). Today it is called Birket Qarun, which means Qarun Pond. Muslims believe that it was the biblical Joseph who widened the canal (Joseph's Canal or Bahr Yussuf or Yusif), and built the world's first dam at El Lahun to regulate the flow of water. During Nile floods, water would enter the Fayoum increasing the water level to as much as 18 meters above sea level, about twice it's current size. Later, water would be drained from the depression to irrigate Lower Egypt. However, at that time Fayoum became Egypt's most fertile agricultural area and Amenemhet III loved the region to such an extent that he abandoned his pyramid at Dashur to build his colossi at Biahmu, Narmuthis, a temple dedicated to Sobek, and at Hawara, his new pyramid and the famous and then very popular Labyrinth. 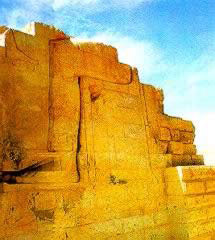 During later dynasties, the Fayoum was little noticed until the Greco-Roman Period, when it achieved it's greatest glory. As soon as the Greeks came into power in 332 B.C., they immediately focused their attention on the agricultural potential of this region, and thus the Fayoum developed a strong relationship to Alexandria. The Greeks, under Ptolemy II, populated the area with Greek veterans, Macedonians and other foreigners who began systematically improving the irrigation methods. They used Greek inventions such as the Archimedes' screw and the sakiya to irrigate over 618 sq. miles of land, much of which had been reclaimed by lowering the level of the lake. New crops, such as the apricot tree were also introduced. The Greeks settled such towns as Crocodilopolis, Karanis and Dionysias, and Ptolemy II named the nome, Arsinoe, after his sister-wife. Apparently, the decline of the Fayoum region began during the late Greek period, but continued during Roman times. Feuds between the Ptolemies required Greek and Egyptian soldiers, leaving few to cultivate the land and keep the irrigation systems in good order. Heavy taxes also added to the problems. Egypt became known as the breadbasket of Rome, and no region suffered more than the Fayoum. Forced to provide corn and harnessed with a devastating tax which was foolish in the extreme, the region suffered a domino effect as the fellaheen were forced to flee their farms and homes. As the population and production shrank, those remaining were even further burdened, until finally in the forth century, the Fayoum was but a shadow of it's former glory. Regardless, during this period the people of the region embraced the new religion of Rome. Christianity was quickly adopted by the people of the region and were some of the last to convert to Islam. According to tradition, St. Anthony visited the Oasis in the forth century promoting monastic life and by the sixth century, there were some thirty-five monasteries. It is unfortunate, but the Fayoum continued a consistent decline from this period until the 19th century ruler, Muhammed Ali, with a brief respite in the late 13th century when a Syrian governor repaired the canals. It is believed that the region reached it's low point during the Ottoman rule. When Muhammed Ali, the ruler who modernized much of Egypt, took control of the country, the Fayoum immediately began to prosper. He instituted agricultural reforms and introduced new crops such as cotton, which continues to be one of the areas major cash crops. He settled the area with Bedouins, and in 1874, built a rail system which linked the region with the Nile delta. The region continued to benefit from the British, who built roads, repaired irrigation systems and began reclaiming some of the land which had been lost to the desert. While the area has never really reached it's pentacle of it's paraonic period, it is once again a viable and important region of Egypt. Today, the Fayoum provides a splendid mix of pharaonic, Christian and Islamic monuments and a rustic charm all it's own. The many pharaonic sites in the area include a red granite obelisk of Senuseret I and the pyramid of Senuseret II at Lahun, the pyramid of Amenemhat III at Hawara and the remains of the ancient city of Karanis, where you can camp and visit the site museum.